Tampa, Florida (February 15, 2017) – Modelithics, Inc. is pleased to announce the latest release, of the Modelithics® COMPLETE Library version 17.0 for use with the Keysight EEsof EDA Advanced Design System (ADS) simulation software. This release marks another big milestone with over 15,000 commercial electronic components from over 65 different vendors now represented in the COMPLETE Library of advanced simulation models. The version 17.0 release contains 34 NEW MODELS, in addition to the already extensive collection of high accuracy, scalable parasitic simulation models. New Microwave Global Models™ for passive RLC components include those for AVX, ATC, IPDiA, Johanson, KEMET, Murata, Taiyo Yuden and ST Microelectronics capacitors, Coilcraft and Würth Elektronik inductors, KOA resistors and Chilisin ferrite beads. A non-linear diode model has been added for a MACOM PIN diode as well as non-linear transistor models for Infineon and Mitsubishi devices. A new Mini-Circuits amplifier X-parameters* model is available, and Modelithics is introducing coaxial connector models with the new substrate-scalable Gigalane flange-mount SMA connector simulation model, validated to 18 GHz. Several new S-parameter file-based models for Vanguard Electronics inductor families are also included in this release. The latest features offered in the Modelithics v17.0 library for ADS include solder mask and solder paste parameters for models with dynamic scalable pads in the CLR Library. These parameters can be set within the models and will translate to PCB layers in the layout. The MSUB blocks in the Modelithics Substrate Library also have these layers, as well as "package" and "leads" layers for increased layout layer control. See the release notes for more information. Modelithics offers a FREE evaluation library, Modelithics SELECT+, which can be downloaded from the Modelithics website. A more comprehensive trial and university use library, Modelithics EXEMPLAR, is also available by request and represents a subset of models in the Modelithics COMPLETE Library, containing all models needed to run the many example projects found on the Modelithics website and as part of the standard installation of the Modelithics COMPLETE Library. 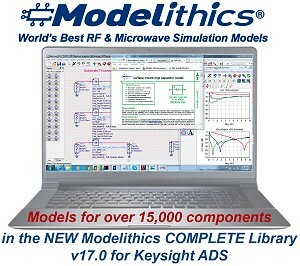 Modelithics, Inc. (www.Modelithics.com) was formed in 2001 to address the industry-wide need for high-accuracy RF and microwave active and passive simulation models for use in Electronic Design Automation (EDA). Modelithics' premium product is the Modelithics® COMPLETE Library, which includes the CLR Library™, containing measurement-based Microwave Global Models™ for a multitude of commercially-available passive component families, the NLD Library™ (non-linear diode models) the NLT Library™ (non-linear transistor models), and the SLC Library™ (system level component models). Modelithics' services also address a wide range of custom RF and microwave measurement and modeling needs. Modelithics® is a registered trademark of Modelithics, Inc. Microwave Global Models™, CLR Library™, NLD Library™, NLT Library™, and the SLC Library™ are also trademarks of Modelithics, Inc. The Modelithics Vendor Partner Program allows for collaboration and open communication during the development of advanced data sets and models for commercially available microwave components and devices, with flexible sponsorship and distribution arrangements for the resulting data and models. An example of such an arrangement is the Modelithics Qorvo GaN Library, a fully sponsored library distributed for free by Modelithics under sponsorship of Qorvo®.